Chronic pain is one of the most prevalent conditions in the United States, affecting an estimated 100 million Americans each year. To put that into perspective, that’s more than the number of people suffering from cancer, heart disease, and diabetes, combined. Many of these chronic pain sufferers are looking for relief beyond pharmaceuticals which can have unpleasant and even harmful side effects. This has brought them to natural pain management methods like chiropractic care as well as natural substances like curcumin. For many people, these treatment options have brought them relief from the pain and help them return to a more normal lifestyle. How does it work though? And, more importantly, can it work for you? Curcumin is a spice that is a relative of ginger and is a component of turmeric. Often in the U.S., the terms curcumin and turmeric are used interchangeably. However, curcumin is what gives turmeric its bright yellow color. While it is often found in curries and other traditional Indian food, it has also long been used to treat a variety of health issues including inflammation that causes pain in the body. These claims have been backed up by several studies that show the tasty spice has tremendous health benefits to offer. These studies have shown that curcumin has strong anti-inflammatory properties although why it works is not yet completely understood. This information has prompted further studies to determine the efficacy of curcumin in treating a wide range of conditions including chronic pain. One study examined the spice’s effects on people suffering from arthritis or joint pain. The results determined that turmeric extract (curcumin) supplements were just as effective as ibuprofen in relieving the pain in patients with knee osteoarthritis. It helped to reduce the inflammation that was causing the pain, bringing the patients much needed relief. You can get curcumin or turmeric supplements but there is no standard dosage information available. Your chiropractor can advise you on how much to take and which supplement brands are the best. You can also use the spice in the foods you eat and gain a good bit of the health properties that way. However, it may be more efficient and easier to take curcumin or turmeric supplements, especially when you are treating inflammation and pain. Curcumin is generally safe with very few side effects. As with any medication or supplement, there are some people who are sensitive to the spice and may experience diarrhea and nausea. However, that usually occurs at higher doses or after the patient has been using it for a long time. High doses could also pose a risk if the person has ulcers. It can also irritate the skin is used topically. If you are considering incorporating curcumin into your daily diet as a health supplement, you should first talk to your doctor or chiropractor to make sure it is safe for you. Women who are pregnant or nursing should not take the supplements. People with conditions like diabetes, gallbladder issues, bleeding disorders, kidney disease, or immunity problems should take special care when using the supplement. Also, it can interact with medications like NSAIDs, aspirin, diabetes drugs, statins, blood thinners, and blood pressure medications so talk to your health professional, such as your chiropractor, before taking. They may adjust your dosage or recommend certain nutritional therapies to better support the supplement. 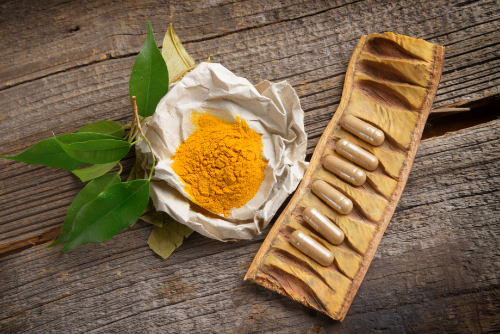 Your chiropractor can help you live a more natural, pain free life and supplements like curcumin may be a part of that plan. They can help put you on the path to a life well lived.